What Eric Demaine presently is to origami and programmable materials, Jaron Lanier was to virtual reality and the augmentation of human experience in the 1990s. At once its most vigorous proponent, its most visible symbol, and the person most able to make his domain’s non-trivial problems seem by turns solvable and engaging. The Professor first interviewed Lanier by phone in 1988; shortly thereafter, The Professor visited Lanier’s company VPL for a hands-on demo. The technology disappointed but the man didn’t. He had jumped the chasm, leaped past the limitations of that period’s sensors and displays to see a larger picture about where technology and society were going. The Professor didn’t meet Lanier again until 1991 at a Double Rainbow ice-cream shop in Palo Alto, not long after VPL was forced into bankruptcy. Failure be damned, The Professor remembers thinking, he was intrigued by the nimble comprehensiveness of JL’s thought process. The Professor will periodically go to his archive so that he can present such material [now and in the future] so here’s the text of that original interview, 26-years old yet presented here online for the first time. And that’s why they call him The Professor. Jaron Lanier is a musician and the founder and CEO of VPL Research, a Redwood City, California-based brain-tank cumcorporation where our future is being given compelling form on an almost daily basis. It is heady stuff. Besides working on two books that he “almost never has time for,” Lanier works as a person possessed, pioneering and pushing the boundaries of “virtual reality,” a software-hardware combination that lets users visualize and then experience their imaginations. Born in New York and raised in New Mexico as a kid who never fit in, Lanier took the desperation of his early life and digitized it. Although he never graduated from any big-deal school or college, his passion for music and his techno-fascination for videogame work led him to Atari. Even way back, he told me he believed that “the images on the screen were made up of little realities that could be changed.” In a sense, Lanier in person is virtual reality made incarnate, a large figure made playful by a child’s sense of wonder. With his iconoclastic, natty-dread image and his radical cyber-citizen ideas, he has become something that the computer field needs: a personality to capture the imaginations of fellow scientists and general public alike. The interview took place by telephone. The Professor [TP] So what are you doing now? 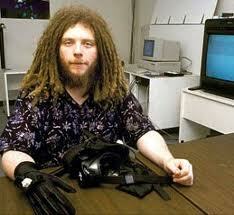 Jaron Lanier [JL] Sitting at a piano; music is a big part of what I do. TP Do you believe technology de-natures or re-animates things? TP So you construct alternate worlds—is physical reality so tragic? TP What’s the immediate future of VR? JL Recent progress has been enormous. Last year, for example, we had the first shared virtual experience. Thee potential for shared objectivity and communication is phenomenal. Since we are too self-conscious and yet not enough aware [as a species], virtual reality is a means of sensitization, be it for education, entertainment or research. By the year 2000, we will have transcended the accessibility, expense and quality issues we face today. Virtual reality will lead to a concentration of cultural experiences by allowing us to change scale, body and identity. While virtual reality can be used as a means of escape, if you are sharing that escape with another and are using it as a tool, then what does our idea of escape mean? TP What about ten or more years in the future? TP What is it like where you work? TP Agreed but why are you here then? JL Why are you in Manhattan? TP OK, I get it. How would you sum up our present moment? n.b., Since the VR days, Lanier has moved on to become an industry consultant, collaborative musician, technology critic, media philosopher and more. Perhaps the best way to see where he’s at now is to check out his two recent books You Are Not a Gadget  and Who Owns the Future? .